Drag within the image to explore the round tower and fire temple in virtual reality. In the virtual-reality environment above you can click on the hotspot on the stairway to enter the round tower. Once in the doorway, look up to note the Romanesque carvings. Then enter the tower and click on the hotspot on the ladder to ascend to the observation platform at its summit. 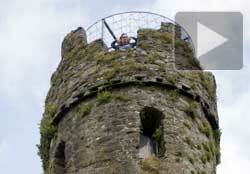 There you can then look out onto the panoramic bird’s eye view of Kildare. 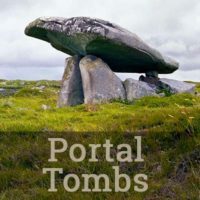 The other hotspot in the graveyard will lead you to the reconstructed foundation of St. Brigid’s Fire Temple; additional hotspots there will take you inside the structure and allow a close-up view of some items left by her pilgrims. 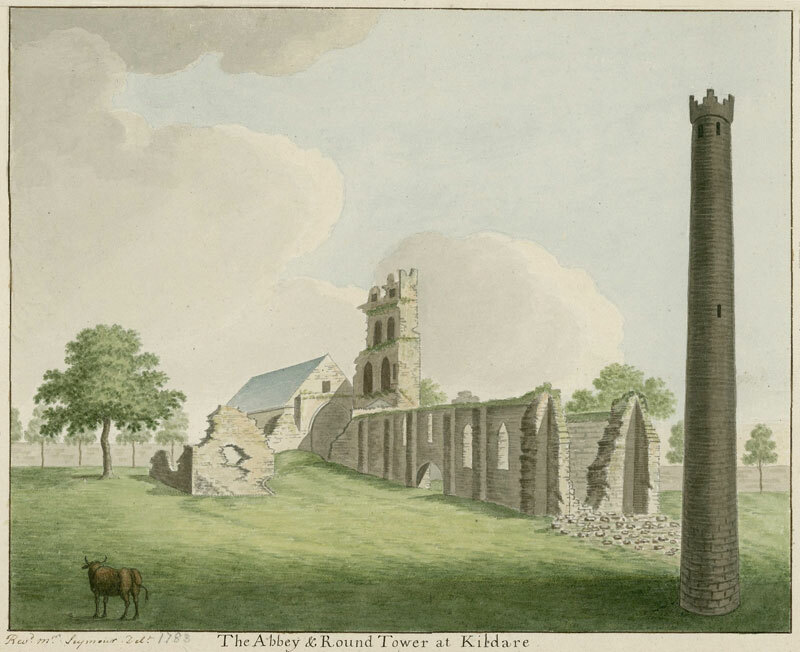 Kildare’s Cathedral Church of St. Brigid today is largely the result of a 19th-century restoration of the Norman structure of 1230. 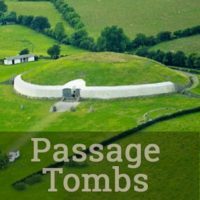 In legend, the hill on which it sits was in prehistory the site of a pagan temple to the Celtic goddess Brigid (see below). 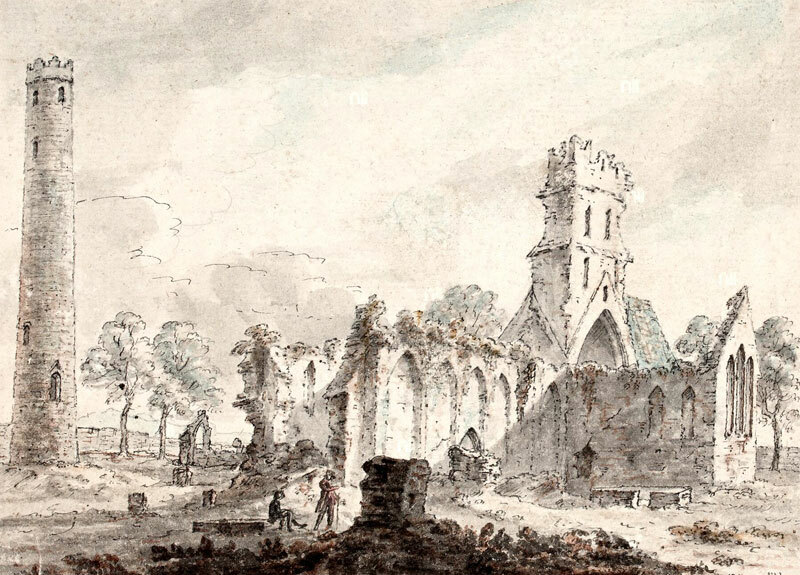 There was a Christian church here from the end of the fifth century, a simple thatched-roof structure, built under an oak tree, and named by St. Brigid Cill Dara, the Church of the Oak, from which derives the modern name of the county and city of Kildare. 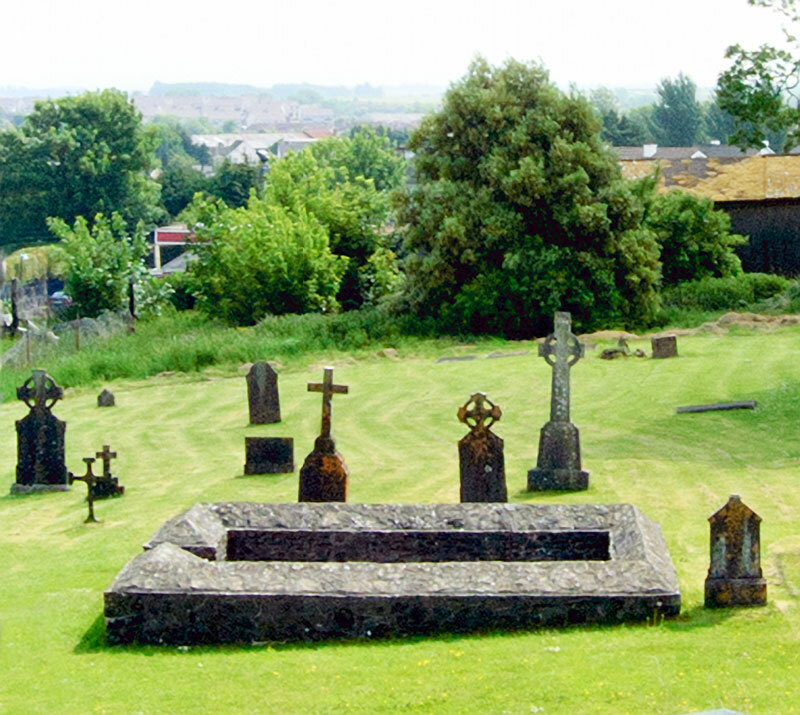 This church evolved to an early medieval stone structure with a defensive as well as a religious function. It was attacked and devastated some 16 times between the years 835 and 998. 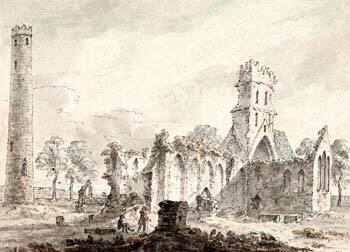 It was a ruin when Ralph of Bristol became the bishop in 1223. 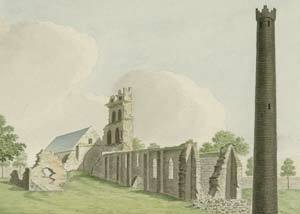 He finished its reconstruction in its present gothic style by 1230, but the building was again partially in ruin by 1500 and abandoned by 1649 (see the Dawson and Seymour prints below). The restored foundations of St. Brigid’s Fire Temple. Most reviews of O’Brien’s work were so scathing that they likely contributed to his insanity and death at the age of 27 in 1835. 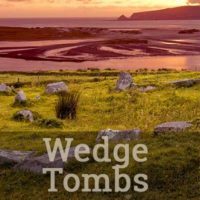 At Aghagower (Co. Mayo) the legend has it that after the tower’s cap and bell were blown a half mile away by a bolt of lightning, the old people could still hear the bell “giving tongue” from beneath the bog where it landed.10 Another tower where the bell was magically thrown into a nearby lake was at Kilmacduagh in Co. Galway (see photo in gallery). 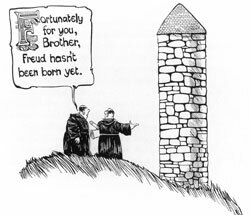 Martyn Turner, Illuminations: 101 Drawings of Early Irish History. Used with permission. 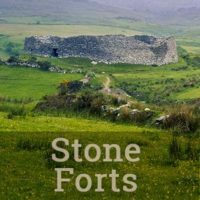 Prior to the arrival of the Normans in 1167, the round towers may have been the only noteworthy buildings constructed of stone in Ireland, at a time that the first church structures were made of wood.14 They may have been constructed with round sides simply because using stone rubble to construct a rounded building was relatively easy; it was more costly to transport and dress the stone blocks needed for a building with corners.15 The doorways in these towers, which could be six meters, or almost 20 feet from the ground, were positioned above a lower story entirely filled with rock rubble for stability. 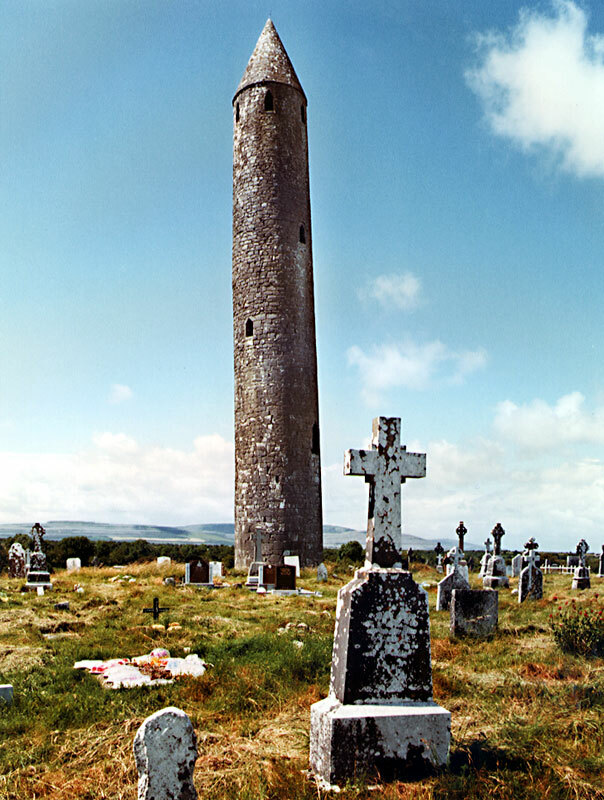 Kildare's round tower is one of only two in Ireland that visitors may climb. 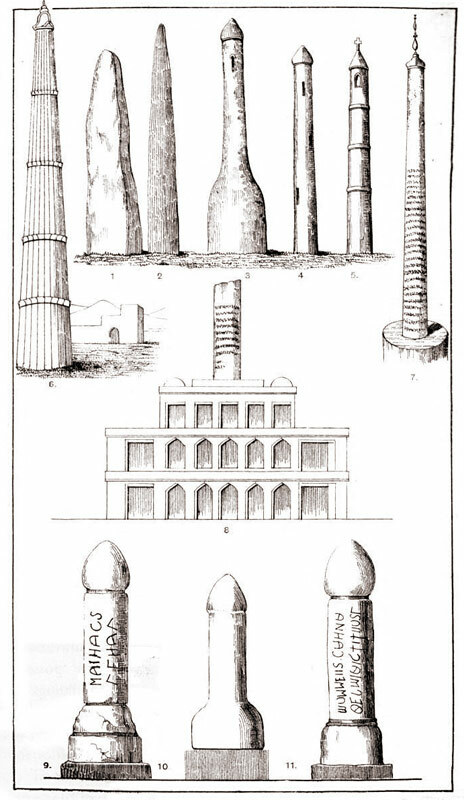 The modern era of radiocarbon dating and scientific analysis has in no way put an end to the ability of the Irish round towers to act as muse for those on a personal quest for a deeper meaning within ancient architecture. 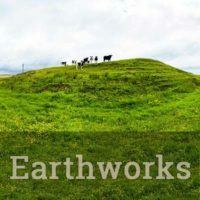 In 2001 American agricultural scientist Phillip Callahan claimed to have discovered that the round towers were made of “paramagnetic stone” that resonates positively in a magnetic field. 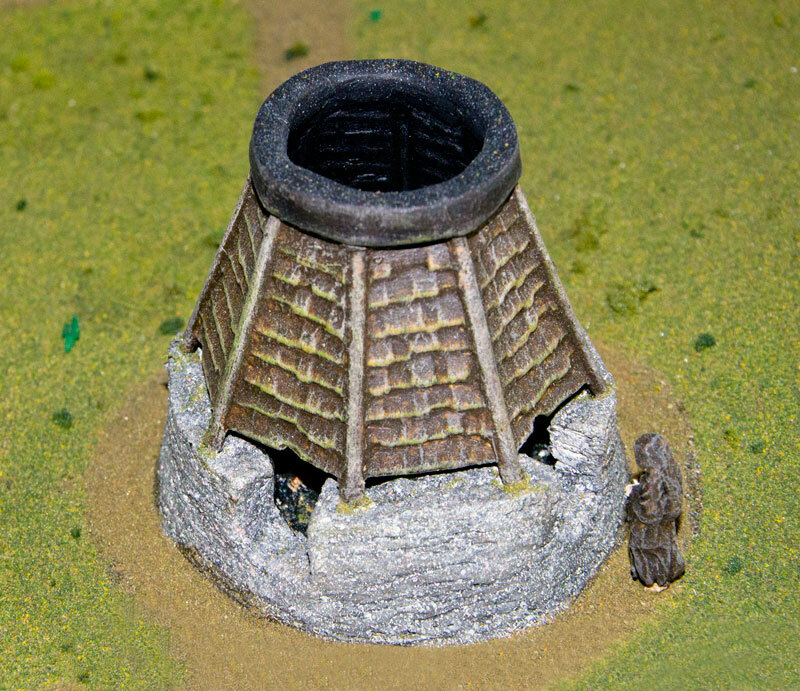 Callahan concluded that the round towers acted as a boon to agriculture, collecting weak magnetic radiation from the sun and transmitted it to the priests and then to the plants growing around the tower. 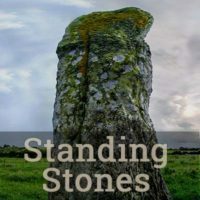 Among her diverse devotees it is sometimes a topic of contention whether or not the St. Brigid of sixth-century Kildare inherited her sacred mantle from an eponymous pagan priestess of the Celtic Iron Age. 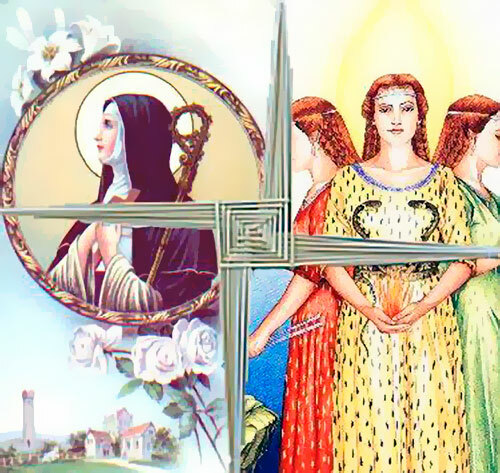 Tying the two together, some believe the Christian saint was originally a convert from the community of acolytes tending the pagan sacred flame, “Brigid’s Fire,” on the site of what ultimately was to become the Fire Temple of St. Brigid. Their shared association with fire is one factor holding together the goddess Brigid with St. Brigid, Ireland’s female patron saint. 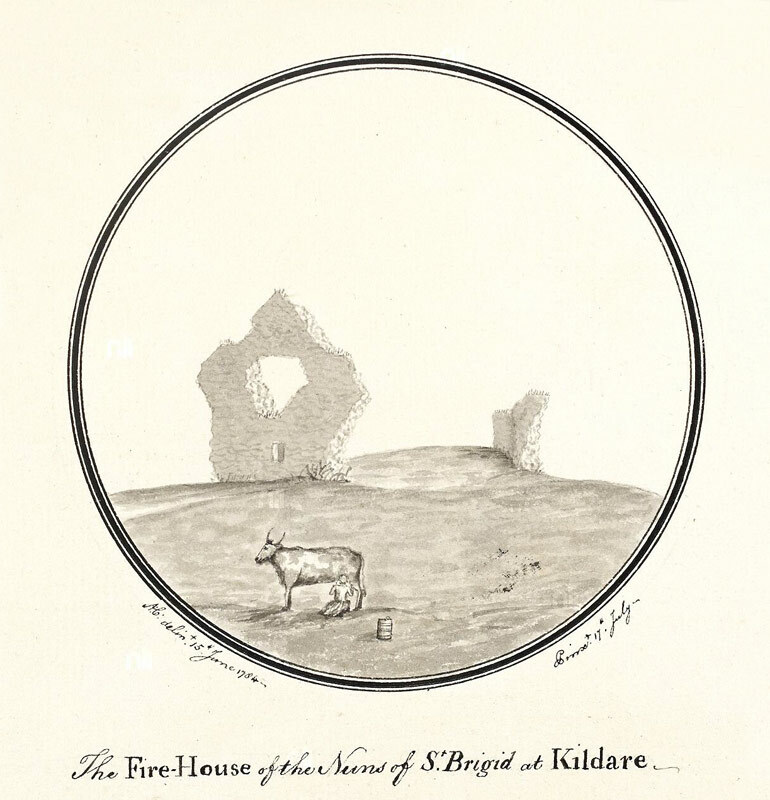 The familiar rush-woven St. Brigid’s Cross may have derived its shape from a symbol of that most fiery of objects, the sun.34 A 1784 drawing of the ruin traditionally known as Brigid’s Fire Temple, or Fire House, may be seen in the gallery at the bottom of this page. Some scholars, however, believe the original Fire Temple was located outside the cathedral compound’s present-day walls.35 Within the virtual-reality environment, top left, there are three different views of the 1988 reconstruction of the Fire Temple foundation. While there are of course no contemporary texts to describe the pagan goddess, this Brigid (Brighid, Brigit, or Bhríde, “Exalted One”) is thought by her devotees to have been a “triple goddess” of poetry, healing and smithcrafting. 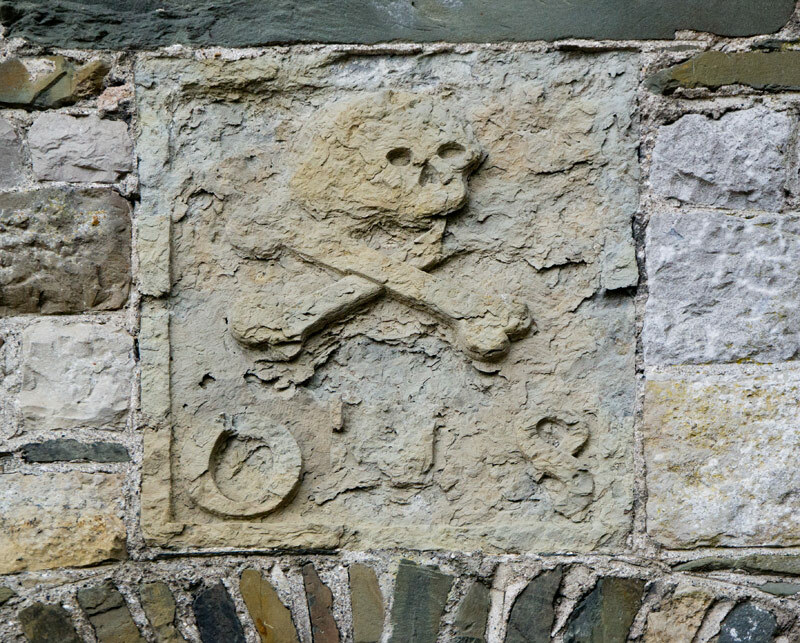 According to one account she was “born at the exact moment of daybreak, [and] rose into the sky with the sun, rays of fire beaming from her head.”36 Her protection was sought over livestock and agriculture. She was reputed to be the daughter of the great Celtic god Dagda and the Morrigan. 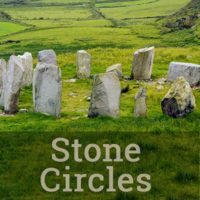 As a fertility goddess, her aspects were venerated not only in Ireland but also in Britain and on the continent. The Celtic festival of Imbolc—marking the beginning of spring—midway between the winter solstice and the spring equinox, coincides with the first of February, the feast day of St. Brigid.37 According to her lore, she and her 19 virgin priestesses, called “Daughters of the Flame,” kept the blaze constantly burning in her original fire temple. 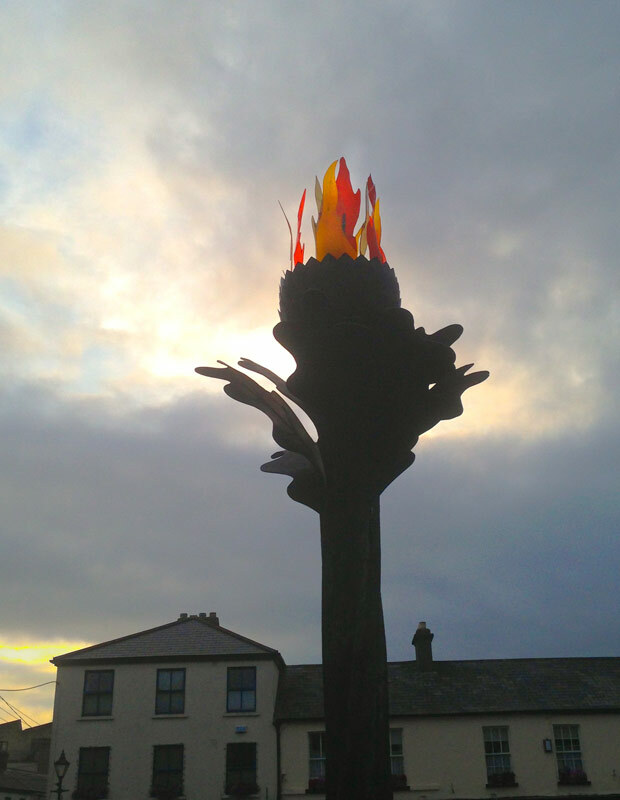 The St. Brigid’s Flame Monument was unveiled on St. Brigid’s Day (February 1), 2006 at Kildare’s Market Square. 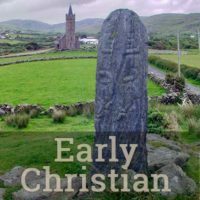 According to some biographers, her pagan father was a local chieftain, and her mother, a Christian, a slave in his household. 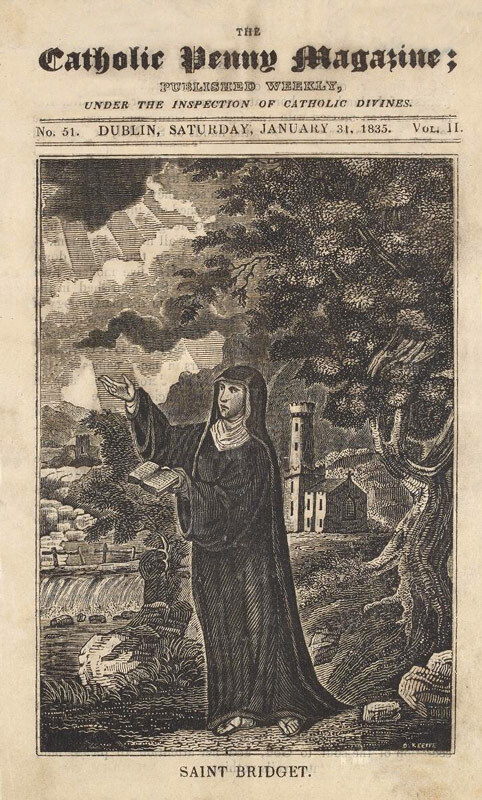 Healing and feeding the poor were among the miracles and wonders associated with the young nun. She was known as a peacemaker who brought healing reconciliation between rival clans. As a bishop, she established side-by-side monasteries, one for men and one for women. These were, in succeeding centuries, to develop into great centers of learning and the arts, with influence over a wide territory. This modern prayer card of St. Brigid depicts her as a nun on the left; on the right she's the pagan "triple goddess" of poetry, healing and smithcrafting. 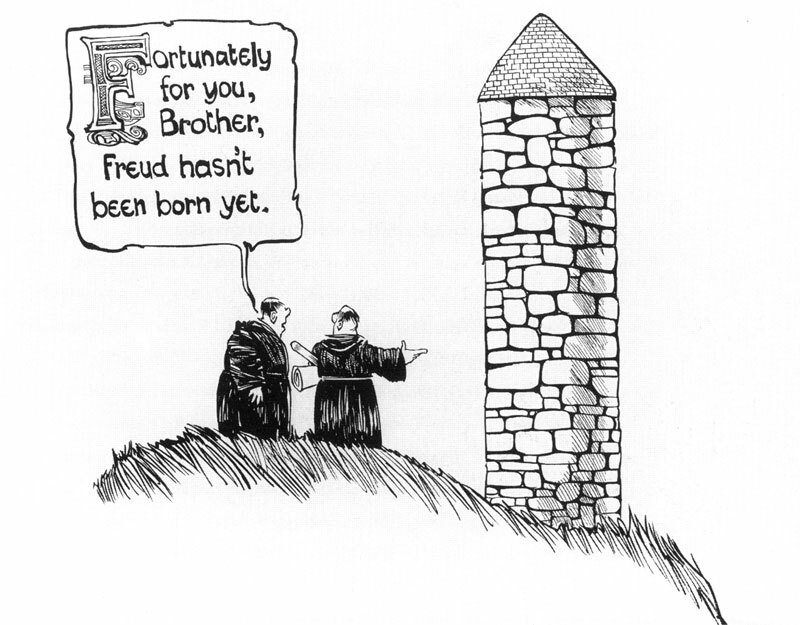 The original flame of St. Brigid of Kildare was extinguished in the 16th century by order of the Norman church hierarchy in its effort to end the trappings of the Celtic Church deemed overtly pagan.49 In 1993, at a conference entitled “Brigid: Prophetess, Earthwoman, Peacemaker,” the flame was ceremoniously re-lit in Kildare’s Market Square and ultimately given a place of honor there atop a bronze, oak-themed sculpture on St. Brigid’s Day (February 1) of 2006 (see photo, above left). Just a few blocks east of the yin of the Fire Temple and the yang of the Round Tower there is today a small group of Roman Catholic nuns, the Solas Brídhe (Brigid’s Light) community of Brigidine Sisters, who proclaim themselves “a restoration of the ancient fifth-century Order of St. Brigid of Kildare.” The group’s mission includes enhancing spiritual opportunities for people of “all faiths and none,” and has set its focus to include not only the teachings of St. Brigid but also the paths of those who blend an understanding of the saint with their own “Celtic Spirituality.”50 Thus the order, perhaps unique among Catholic women religious, embraces the goddess tradition of their saint’s possible progenitor. 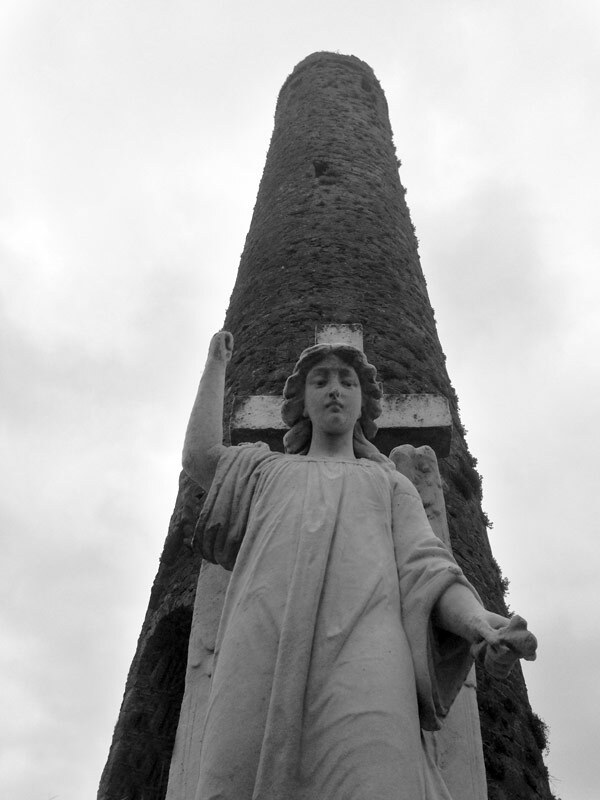 While the sculpted monument with its flame stands in Kildare’s public square, the Solas Brídhe sisters lovingly tend the flame of St. Brigid’s Fire Temple at a sacred spot inside their home.